NEW YORK, Jan 21 2012 (IPS) - In most mainstream media the words “corruption” and “election fraud” accompany images of makeshift polling stations manned by armed guards in Burma or burning tires beside tattered ballot boxes in South Sudan – the insidiousness of stolen elections and a crumbling democracy is very seldom associated with the United States. But this week, scores of indignant citizens in well over a hundred cities across the U.S. took to the streets to expose how the richest one percent has hijacked the very foundations of democracy in a country whose constitution of 1787 promised to be by the people, for the people. Jan. 20 marked the second anniversary of the landmark Supreme Court ruling in Citizens United vs. the Federal Election Commission (FEC), where the country’s most respected justices “overturned a hundred years of election finance laws by ruling 5-4 that Congress cannot limit spending by corporations in elections”. The decision struck at the very heart of what many U.S. citizens have felt for years – that despite a careful constitutional separation of the executive, legislative and judicial branches of the government, corporate capital had infected the body politic from head to toe. The result, according to Lisa Graves, executive director of the Centre for Media and Democracy (CMD) and a coordinating member of the constellation of organisations dubbed United for the People, has been an increase in outside spending on elections from 68.9 million dollars in 2008 to 304.7 million after the ruling. “Today, we have turned out activists in hundreds of cities across the country to protests the idea that money is speech and corporations are entitled to equal rights as human beings,” Graves told IPS. “We are demanding that this decision be overturned by a constitutional amendment,” she added. By ruling that the government cannot curb spending and lobbying by unions, corporations or even powerful individual stakeholders, the Supreme Court green-lit the proliferation of Super PACs (political action committees) that are unfettered by electoral laws or transparency and free to pour unprecedented amounts of money into campaigns of their choosing. Super PACs can also drag their feet on releasing hard data on how much money actually changes hands during election cycles and, in the new arena of impunity granted by the Supreme Court, can accept donations from registered 501(c) nonprofit entities that are exempt from exposing the identities of those who bankroll elections at will. Much of this money is funneled directly into TV ads, the bulk of them bordering on smear campaigns against opposing candidates. According to investment banking and asset management firm Needham and Co., television stations this year will rake in as much as eight billion dollars from political campaigns. President Barack Obama’s own campaign adviser, David Axelrod, claims that these competing commercials have become the “nuclear weapon” on the battlefield of electoral politics. With the “occupy” movement still blazing despite the freezing weather, hundreds of protestors amassed outside multiple courthouses Friday under the banner “occupy the courts“, chanting and passing out flyers about the corrosive impact of corporate influence in politics. 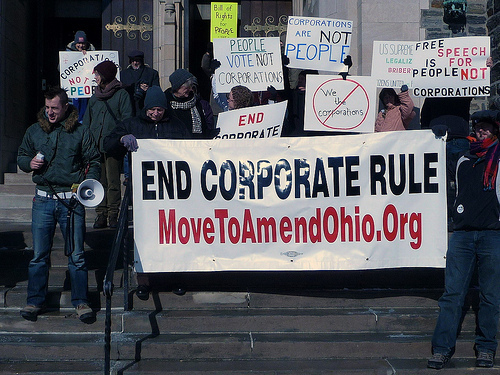 “The Citizens United ruling is the perfect example of the undemocratic nature of a society controlled by the one percent,” Tony Murphy, an organiser with Occupy For Jobs, told IPS. Murphy was arrested Monday for participating in a peaceful action inside the lobby of a Bank of America, in commemoration of Martin Luther King Jr. Day. “We didn’t block anybody from using the ATM machines – we were arrested for nothing more than calling for a comprehensive jobs programme, like the kind we saw in the 1930s, where the government put millions of people to work. The only way to fund such a programme today would be to get money from the one percent who are sitting on top of trillions that really belong to the people,” he added. “A society run for the one percent will always allow them to write their own legislation and govern in ways that are favourable to (capital),” Murphy said. Koch Industries – the multi-billion dollar project of the Koch brothers, which funds faux grassroots campaigns to eviscerate the few remaining labour and environmental protections available in the U.S. – have also come under fire from activists for epitomising the Goliath in the fight against dark money in electoral politics. Thanks to the Supreme Court’s ruling two years ago, it is now virtually impossible to track the money channeled by Americans for Prosperity, the brainchild of billionaire oil baron David Koch, which acts as a front for various groups bankrolling the Tea Party.